Congratulations Michael, our 2015 Soon to be Famous Author Project Winner! 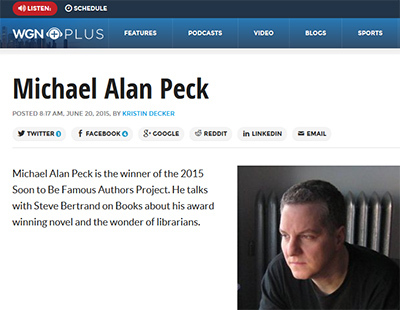 2015 Soon to be Famous Illinois Author Winner Michael Alan Peck on WGN with Steve Bertrand on June 20, 2015.It is a great 11-minute listen. 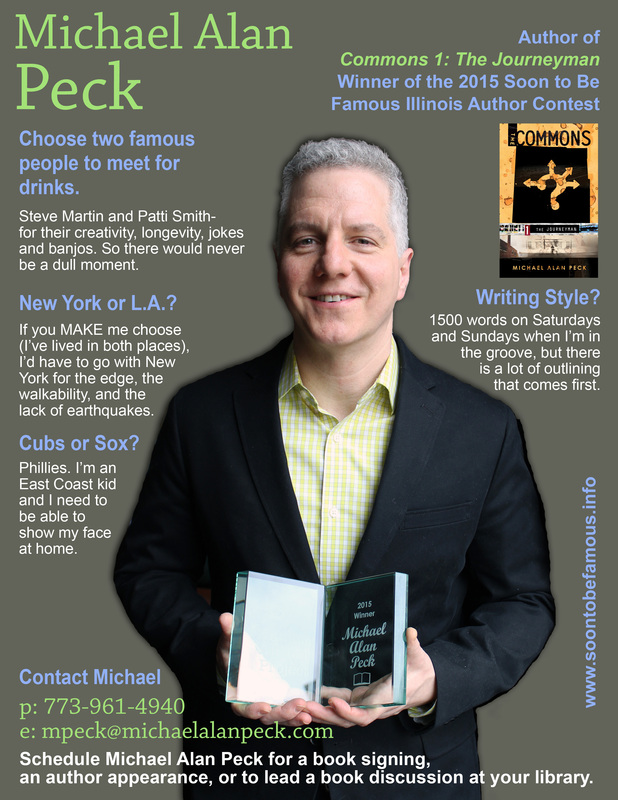 A little one-on-one with 2015 winner Michael Alan Peck. Steve Martin and Patti Smith – For their creativity, longevity, jokes and banjo. So there would never be a dull moment. If you make me choose (I’ve lived in both places), I’d have to go with New York for the edge, the walkability, and the lack of earthquakes. High School. I’m up on the newest gadgets and tech with all but smart phones. My cell phone is ancient. I’m a big fan of being unreachable. Phillies. I’m an East Coast kid, and I need to be able to show my face at home. The Wire for drama, and the British version of The Office for comedy. Depends on the mood – Coltrane, Miles Davis, Ahmad Jamal, Ramones, Morrissey, Springsteen, Stars of the Lid, Kyle Bobby Dunn and a LOT more. 1500 words on Saturdays and Sundays when I’m in the groove, but there’s a whole lot of outlining that comes first. Computer (Scrivener, to be precise) I revise and edit, a lot. Dogs. I need something that can go from sleeping to full-on enthusiasm in two seconds flat. Flammable. Technically, it’s not a real word. (The word used to be inflammable) But it’s more important that people know what it means. REALLY IMPORTANT. People use quotation marks just because they look important. Oh, and when people text when walking down steps.